The Stirling City Historical Society hosted a Christmas Social and Potluck at the Stirling City Museum on Sunday, 15 December 2013. 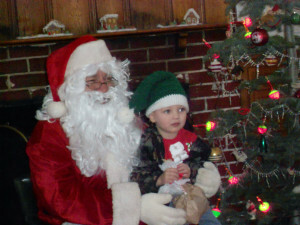 Kash, grandson of Leon and Karen Wagner of Stirling City, sat on Santa’s knee and told him what he wanted for Christmas. “It’s a secret!” Santa handed out bags of Christmas goodies to 24 children. Homemade gingerbread houses adorned the fireplace mantel next to a Silvertip Fir Christmas tree donated by the Volunteer Fire Department No. 12, and decorated with antique and new ornaments.